LucasArts is best-known for its endless supply of Star Wars games, but the company really hit a peak in the adventure game genre from 1986 to 2002 when they combined elements of interactive fiction with graphics and a new interface. Check out LucasArts' colorful past with games like Day of the Tentacle and Maniac Mansion, in our tour of adventure games past. LucasArts' first adventure game was actually Lucasfilm Games' Labyrinth , based on the movie of the same name. The developers consulted with Douglas Adams on the game, and he suggested that they make it a hybrid game that starts as a text adventure, and then turns into a graphical game. Their first true science fiction game was 1987's Maniac Mansion, which contained the technology that was used in LucasArts' games for over a decade. It introduced new ideas like multiple endings, multiple character, and clues there were hidden in the cutscenes, which was a clever way to make you watch them. LucasArts famed SCUMM engine was created for this game, and used for many more of their interactive adventure titles. SCUMM actually stands for Script Creation Utility for Maniac Mansion. It's been ported to multiple systems, and you can still play those classic LucasArts games on it. Maniac Mansion was inspired by B-movies, and features a storyline complete with mad scientists, disembodied, sentient tentacles, and an evil mastermind played by an also sentient Purple Meteor. Players have to figure out how to stay alive and save the Earth from the Meteor. In part of the game, characters can actually microwave a hamster, and when this game was ported to the Nintendo Entertainment System, they were ordered to take it out. However, they noticed it a bit too late, so it made it onto all the North American game cartridges. In 2004, fans collaborated and enhanced the game graphics, added music, fixed glitches, and released as freeware Maniac Mansion Deluxe. LucasArts/Lucasfilm Games visited the world of science fiction again in 1988 with Zak McCracken and the Alien Mindbenders, where titular hero Zak had to help fend off an alien invasion by the Caponians. They want to lower the intelligence of everyone on Earth by using dial tones. Luckily Zak finds some ancient technology left behind by the Skolarian race which can be used to fight the Caponians. Unfortunately the parts are scattered all over Earth and Mars, and you have to go around collecting them. In later games the developers decided to make it impossible to actually kill one of your characters, although this new "rule" was broken a few times. LucasArts went on an adventure game tear after Zak McCracken, producing Indiana Jones and the Last Crusade: The Graphic Adventure in 1989, The Secret of Monkey Island in 1990 (probably the title most remembered and most associated with LucasArts), and Monkey Island 2: LeChuck's Revenge in 1991. During this period, in 1990, Lucasfilm Games became LucasArts during a reorganization of the company. They returned to the realm of science fiction with Indiana Jones and the Fate of Atlantis in 1992, the sequel to Maniac Mansion, Day of the Tentacle in 1993. Indiana Jones and the Fate of Atlantis was a game not based on any previous Indiana Jones, and featured Indy going to the lost city of Atlantis. He eventually encounters a huge machine called the Colossus, which runs on a mineral called Orichalcum. This device gives the Atlanteans godlike powers, and comes in handy if you want to turn yourself into pure energy. The cover art for the game was created by lead artist William L. Eaken in an effort to emulate Drew Struzan's work on the previous Indiana Jones movie posters. In fact, LucasArts eventually released movie-style posters promoting this game. Dark Horse Comics released a four-issue miniseries based on the game, and also for the planned sequel that never came out called Indiana Jones and the Iron Phoenix. It involved Indy finding the Philosopher's Stone that could transmute metals and bring people back from the dead. The Nazis planned to use it on Hitler's ashes. In Day of the Tentacle, you return to the original Mansion, and do battle against the Purple Tentacle, who drinks toxic waste and grows arms. Oh, and he also wants to take over the world. This game features time travel, and lets you go back in time to interact with historical figures like Ben Franklin, John Hancock, and Betsy Ross. In fact, time travel ends up being the very thing that saves the day. Just try and forget the fact that they are portapotties turned into time travel devices called "Chron-o-Johns." Inside the game, you could use Ed's computer to play the complete and full version of the original Maniac Mansion. 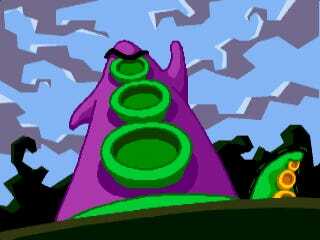 Other games have done this since, but Day of the Tentacle was one of the first. In 2004 Adventure Gamers compiled a list of the Top 20 Adventure Games of All Time, and Day of the Tentacle topped the list. By the mid to late 1990s, LucasArts adventure games had begun to decline in sales. Console games were becoming more popular, as well as first person shooters. The Dig became the last science fiction game released by the company in 1995. After that they released two more Monkey Island sequels, and the afterlife themed Grim Fandango before shutting down the adventure games development in 2000. Since then, LucasArts has focused mainly on developing Star Wars and Indiana Jones games. The Dig was an ambitious game produced by Steven Spielberg for LucasArts, which very nearly didn't come out. It was based on a story idea that Spielberg originally had for Amazing Stories, and had dialogue provided by Orson Scott Card, and was written by both Spielberg and interactive fiction author Brian Moriarty. It began development in 1989, but wasn't released until six years later. The story involved a team of astronauts placing explosives on an asteroid on a collision course with the Earth, a la Armageddon. However, things go pretty well, and the mission seems to be a success. However, once they investigate the surface of the thing, they get zapped to a faraway world. Commander Boston Low (voice by Robert Patrick) and his team have to explore their alien surroundings and find a way to get back home. The Dig was the first LucasArts game to have its soundtrack sold separately on CD, and a novelization of the game was written by Alan Dean Foster, who has written numerous Star Wars novelizations, and well as ones for the Alien films. LucasArts actually filed a "notice of opposition" with the U.S. Patent Office against the website Digg in 2007, saying that they were infringing on their trademark on The Dig. They settled out of court, and the opposition was withdrawn later that year. Most LucasArts games feature reference to other LucasArts games, the numbers 1138 (from THX-1138, Lucas' first film), and Han Solo's line "I have a bad feeling about this." Several of the games also feature a plant named Chuck, which has become a running joke amongst game developers. He first appeared in Maniac Mansion, and later made his way into other games. Besides the science fiction games, LucasArts also produced the motorcycle adventure Full Throttle (my personal favorite), the magical adventure Loom, the Monkey Island series of pirate adventures (four games total), Sam & Max Hit the Road, and Grim Fandango. Hopefully, we'll see games like this coming out once again.